Some days we awaken to sunshine and the reality of the Divine Love that pulsates within us. Most days we exit our slumbers to feel a cloud lie over the landscape of our being; a psycho-spiritual layer that is neither joyous nor depressing, just ordinary. Living in these apparently physical bodies in the midst of a soul filtered reality, ordinary usually seems the norm. Yet high above the cloud cover of our day-to-day lives lies a great Mystery, a Source whose desire has birthed our oft plodding journey from birth to old age and beyond. So why are things so ordinary and often boringly difficult? Well I reckon that Divine Love has allowed it to be that way. Please let me explain. 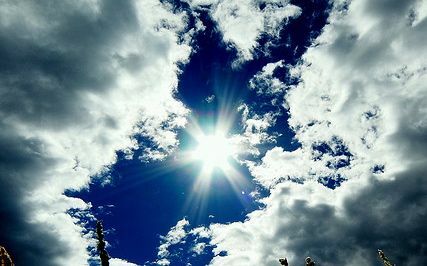 The cloud cover in question is the sunscreen of ego, that which mischievously blocks out the Timeless Rays of Divine Source. To permanently live in the manifestation of the One we call God would be to burn up, leaving only the spirit spark deposited in the oyster shell of our sense of Being. Allowing ego to do its thing is actually a blessing in disguise. Of course ego doesn’t see its power plays being utilised and integrated into the Divine Will. It believes itself to be a rebel who will one day do away with Source for good, creating a well-rounded and independent human being. Yet even this delusion is allowed for it drives ego in its frantic efforts to be free. No, Divine Love, is quite happy for us to pass many of our days under the cloud cover of ego’s ways as we journey through life. Well, given time and space ego will drive us to our knees, exhausted by its efforts to control and regulate our psycho-spiritual health. At the appropriate time, our personal cloud will break, if only temporarily, to allow the shocking Light to break into the dark, lonely caverns of the Soul. Ego is powerless against the Light, the contact of Source and sourced. Once touched by the heat of the Divine Fire, there is no longer a mundane, boring life struggle, for we have seen what lies Beyond. As ego recovers to spin its yarns of superheated imagination and spiritual delusion we can afford a wry smile. No longer are we trapped under the power of its ‘ordinary’ spin, for now we know. We are not ordinary. We are the offspring of Ultimate Reality. Such a knowledge cannot be learned or accumulated from religious or spiritual texts, nor their interpretive dispensers. It has to be experienced. Thankfully, Divine Love is content to wait its time. No frustration lies within the Heart of the One we call God. So let’s embrace our ordinariness today as we experience our ego spun illusion, knowing that we know better. We have seen as we are seen and carry within us the eyes of a New World, that referred to as ‘The Kingdom/Queendom’ by the One who claimed ‘I Am the Light of the World’. Glad that it touched you somewhere deep within.